Eastern senior Kaleb Hill (44) shoots a layup in front of teammate Colton Reynolds (14) and Bobcats Gage Sampson (2) and Caden Blizzard (1), during the second half of the Eagles’ 63-61 setback on Thursday in Tuppers Plains, Ohio. TUPPERS PLAINS, Ohio — Sometimes a 32-minute game is just a little too long. 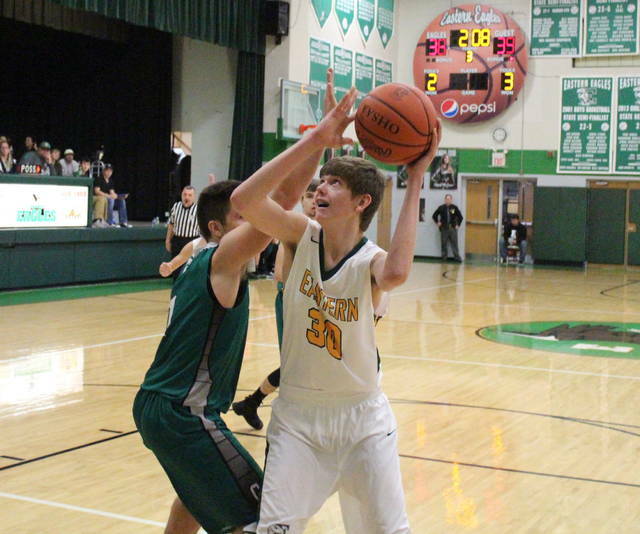 The Eastern boys basketball team led by one point with 30 seconds to go in Thursday’s non-conference tilt at ‘The Nest’, but visiting Green scored three unanswered points and escaped Meigs County with a 63-61 victory. The Eagles (2-4) scored the opening nine points of the game and led by as many as 10 points in the first quarter. Green (5-5) cut the EHS lead to 17-9 by the end of the first and overtook the Eagles within the opening three minutes of the second quarter. The hosts were back in front, at 27-26, with just under two minutes to go in the first half, but the Bobcats ended the half with a 6-2 run and a 32-29 lead. The Eagles regained the lead within the opening two minutes of the second half and stretched it as high four points, at 43-39. However, Green scored seven unanswered points to end the third quarter with a 46-43 advantage. Eastern began the finale with a 6-1 run and held a 49-47 advantage with 6:20 to play. Green tied the game at four times before regaining the lead, at 57-55, with 3:00 to play. The Eagles tied the game at 57, but GHS answered with its only three-pointer of the period, with 2:19 to play. Back-to-back two-pointers gave the Green, White and Gold a 61-60 lead with 1:42 to play, but the hosts didn’t score again. The guests took the lead on a pair of free throws with 21 seconds to play and then forced a turnover with six seconds to play. 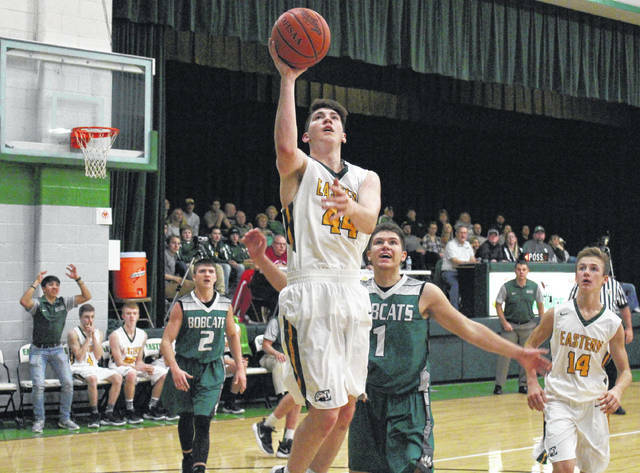 Green added one free throw with four seconds remaining and Eastern’s last-ditch three-pointer sailed long, giving the Bobcats a 63-61 victory. The Eagles shot 24-of-57 (42.1 percent) from the field, including 3-of-12 (25 percent) from three-point range, while the Bobcats shot 21-of-51 (41.2 percent) from the field, including 7-of-17 (41.2 percent) from deep. Both teams made 66.7 percent of their free throw tries, Eastern going 10-of-15 and Green shooting 14-of-21. Eastern won the rebounding battle by a 36-to-25 tally, including 15-to-11 on the offensive end. EHS committed 15 turnovers, five more than its guests, but had a 11-to-10 edge in assists and a 4-to-1 advantage in blocked shots. The Bobcats finished with a 10-to-6 steals advantage in the win. Isaiah Fish led the hosts with 19 points, on seven field goals and four free throws. 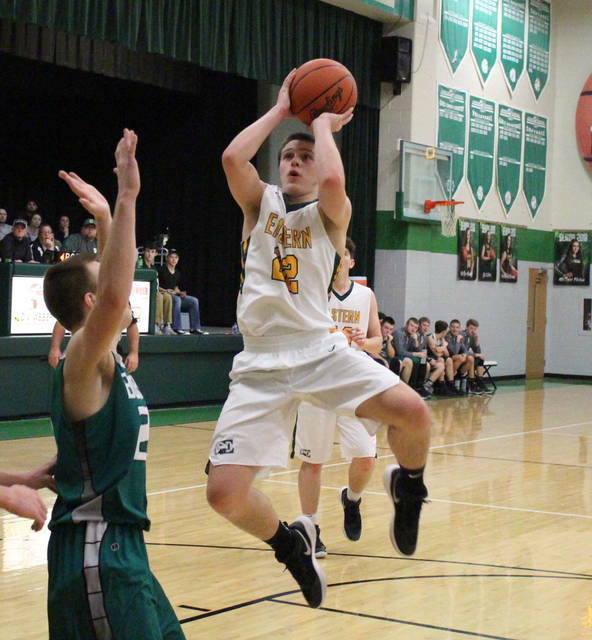 Garrett Barringer had 13 points in the setback, while Kaleb Hill and Colton Reynolds scored nine apiece. Blaise Facemyer and Sharp Facemyer rounded out the Eagle scoring with seven and four points respectively. Fish, Reynolds and Blaise Facemyer each made a three-pointer for the Eagles. Hill led the hosts on the glass with 15 rebounds, followed by Barringer and Fish with six each. Reynolds dished out a team-best six assists, Barringer had a game-high two blocks, while Fish, Reynolds and Sharp Facemyer each had a pair of steals. 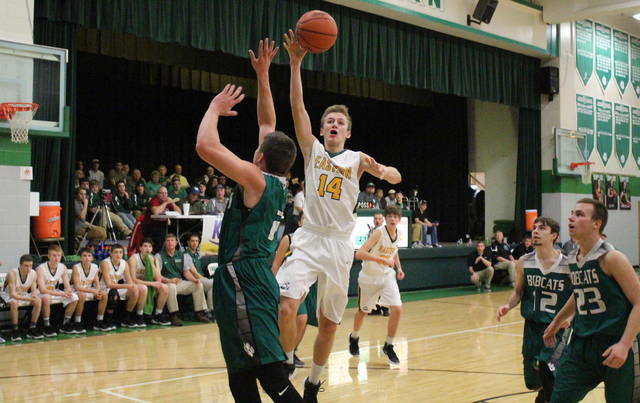 Tanner Kimbler sank six three-pointers and led the hosts with 25 points. Tayte Carver added one triple and finished with 14 points, while Gage Sampson finished with a double-double of 12 points and 12 rebounds, to go with a team-high four assists. Zach Huffman scored six for the visitors, Rylee Maynard added four, while Caden Blizzard had two. Maynard led the GHS defense with three steals, while Sampson had two steals and a rejection. This was the lone scheduled meeting between GHS and EHS this season. The Eagles return to action on Tuesday when Nelsonville-York visits ‘The Nest’.